Different training topics that range from integration programs for newcomers to specific skills development in business leadership for top managers are just a few examples. We believe that everyone has different skills, levels of understanding, responsibilities and objectives, so we do everything we can to personally cater to each individual. Our goal is to help the Essilor teams maximize their talents and grow at their own pace, while nurturing their potential and evolving professionally. This is why Essilor offers the following top five learning and development opportunities – taking its employees from recruitment to career peak performance. Essilor U is everyone’s chance at success. It is a digital learning platform, currently the Group’s most accessible learning tool, that connects more than 43,500 employees and partners through online learning. It is extensively used during the first three months after recruitment and provides access to more than 1,395 videos and courses on topics that fall within the scope of personal development to Essilor’s principles, values and mission. Select individuals also have access to over 20,000 off-the-shelf leadership and business modules like Harvard ManageMentor®. However, everyone is encouraged to develop their potential through Business Management, Leadership Development and Expertise Development classes and our corporate programs are designed with leading business schools and coaching networks. Overall, Essilor promises to cater to the evolving needs of each employee throughout the different stages of his or her career. To put it simply, our employees’ success is our success. Vision Essilor, a global on-boarding program, is an annual event that brings more than a hundred employees and partners together to better understand our business, mission, culture and values. 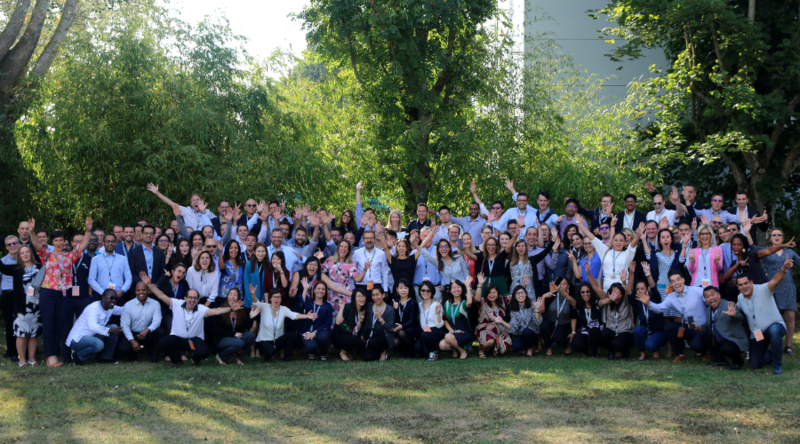 Coming from over 27 countries, the participants discover the true essence of what it means to be part of the Essilor Group – being diverse yet inclusive. They enjoy exploring strategic issues, and engaging in dialogues with key leaders and top managers. The business environment is changing faster than before and in order for organizations to thrive in a global environment, we need to constantly innovate and adapt. Knowing this, Essilor established the Business Management Curriculum to help its talents improve their business knowledge, have a deeper understanding of the changing business landscape and be more equipped to manage change successfully. To ensure that we are constantly ahead of the game, Essilor has forged long-term global partnerships with leading business schools, like ESSEC and INSEAD in Europe, Nanyang Technological University in Asia and McCombs School of Business in America. We encourage our employees to think outside the box, while providing them with the necessary skills to construct and implement strategic and creative approaches. Essilor is dedicated to creating top leaders, because they are essential for success. Our leadership programs have a unique combination of plenary sessions, co-development workshops and several follow up meetings that focus on self-development. For example, the Transition from Management to Leadership (TML) program hires executive coaches from across Europe and Asia to help our leaders identify leadership strengths and acquire new management skills. Through the use of 360-degree leadership assessment tools and experiential learning, our leaders develop the skills and emotional intelligence that are in line with Essilor’s principles, increasing their confidence and the ability to influence. Today, women are at the forefront of our leadership programs, because of the impact they have on organizational culture. Essilor believes and invests in its women, and encourages its future women leaders to participate in the Asia and Europe session of Programme EVE. Organized by DANONE, it is an inter-company program that helps women build their network, share their experiences and understand how other companies roll out best practices on diversity and inclusion topics. Our teams, now more than ever, need to be alert and responsive in today’s fast and dynamic market. 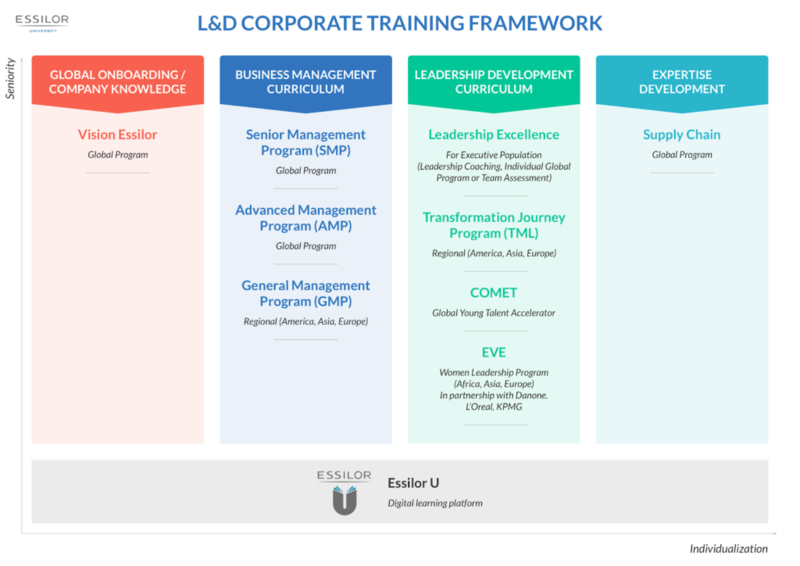 Understanding this, Essilor started the Expertise Development program. It has become one of our focus areas for improvement and includes a series of courses, targeted at specific functions that help identify new market trends, facilitate communication of internal knowledge and increase the various forms of cooperation within Essilor.